SAGINAW, MI- The Sarnia Sting got off on the right foot with a solid showing in their 2018-19 season opener, knocking off the Saginaw Spirit on the road by a final score of 6-2. The Sting were originally slated to start the season vs West Division rival Sault Ste. Marie Greyhounds, however the club was unable to cross the Mackinaw bridge due to high winds. The Greyhounds vs Sting match up has been postponed to a date still to be determined. Still carrying three net minders, Aidan Hughes got the nod for the Sting and played very well to back stop Sarnia to the win, including some key saves as the home team made a push in the third period. Sophomore forward Jamieson Rees registered the first goal of the season, banging the puck across the line on a wrap around play in the first frame. It was a also a night to remember for 2018 first round selection Jacob Perreault who scored not only his first but second goals of his OHL career on this occasion. 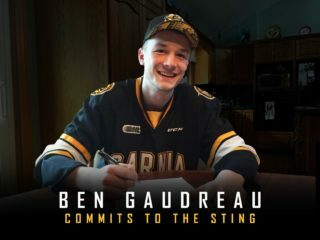 Perreault becomes the first Sting rookie to score two goals in their OHL debut since Steven Stamkos in a 7-3 win vs. the Plymouth Whalers in 2006. Perreault’s first goal came on a beautiful a one-timer after a nice little dish from Mitch Eliot to put the Sting up by a pair. A clean faceoff win from Theo Hill found the puck right on the stick of Perreault and he would snap home his second of the night. 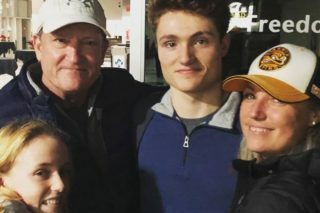 After returning from Calgary Flames Training Camp Adam Ruzicka has already found himself on the highlight reel. After the Spirit would find the score sheet to bring the game to 3-1, Ruzicka would put the nail in the coffin, walking out from from behind the net, dance into the slot and roof his first goal of this season. Overage forward Anthony Salinitri also had himself a two goal night, while Aidan Hughes registered 28 saves on 30 shots in the win. The boys return home for Home Opening Weekend 2018 as the Flint firebirds enter the Hive on Friday night, followed by a date with the Soo Greyhounds the next evening. Secure your tickets here: ticketing.sarniasting.com or call the Mainstreet Credit Union Sarnia Sting Box Office at 519 541 1717.